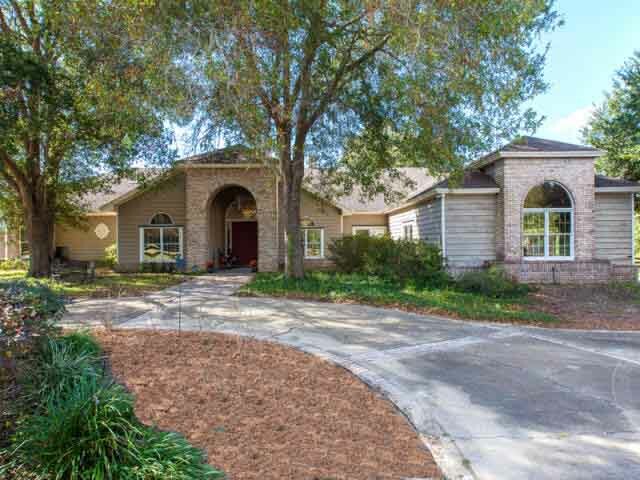 CUSTOM BUILT DAVE BREWER 5 BR, 5 BATH EQUESTRIAN ESTATE ON 10 ACRES. This "Grand Cypress" model impresses with 4,600 square feet of living area (6,977 total) and architecturally designed walls of glass show off views of the resort-style pool, gorgeous pastures & postcard sunsets, wooded views and rolling pastures from nearly every room. The chef's kitchen boasts an abundance of 42" birch cabinets with crown molding, large center island with cook top, built-in oven and microwave, Sub-Zero fridge with matching birch panels, trash compactor, triple sink under large windows with view directly to pool & built-in desk with open eating area that leads right to the expansive family room with glass windows & doors leading out to the pool area, plantation shutters and wood burning fireplace encased in Keystone coquina. The luxurious Master Suite with fireplace is huge and features another wall of windows with 3 large walk-in closets, separate vanities and make-up station. Sunken whirlpool tub overlooks private screened courtyard with heated spa. Wide French doors lead out to large covered deck with full summer kitchen and the massive inviting pool/spa area, including three storage closets perfect for entertaining. There is a separate entrance to a secluded 5th bedroom that would make a perfect Mother-in-Law Suite, artist studio, private office, or guest suite. Entering the home through the 10' solid wood front doors immediately showcases windows galore with views of the pool out the large formal living room featuring a fireplace and dual built-in bookcases. An open dining room to the side of the foyer is adjacent to the kitchen for easy entertaining. One of the five bedrooms is currently used as an office and has a wall of built in cabinets and shelving. From 441 in Mt. Dora, head east on Wolf Branch Road to Equestrian Trail. From SR 46 in Sorrento, turn right on CR 437 to Wolf Branch, go left & down to Equestrian Tail. Head north on approx. 1 mile. Property is on your left just past Integrity Way.